What is so different and appealing with Monet’s flower garden is its very natural look. The gardeners apply themselves to avoid that flowers seem regimented. It is not as simple as it sounds. We as humans have a tendency to organize. Spontaneously, unconsciously, what we do and make turns out to be regular. One of the gardeners’ trick for planting bulbs randomly is to throw them on the ground, the bare ground of late Autumn. Where the bulb fell, there it is planted. 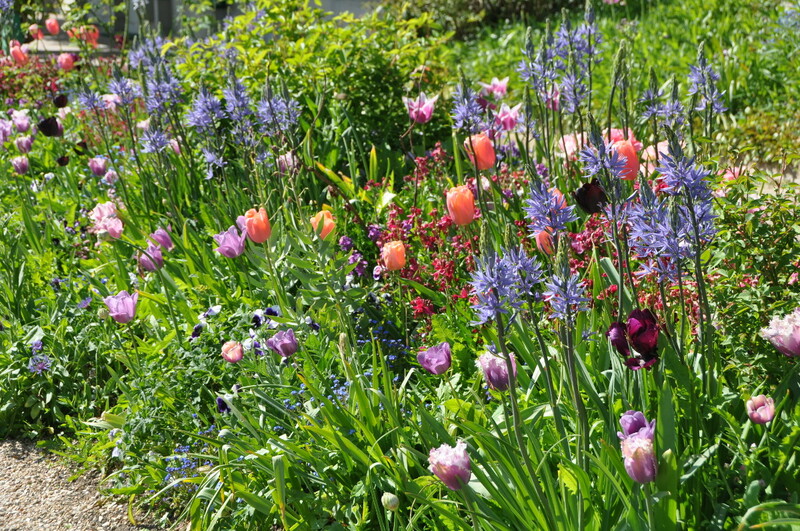 This tip works for camassias or tulips. Biennals are planted by color patches that combine different varieties, wallflowers, pansies, violas… Sizes, shapes and hues of the same color help creating the impressionist brushstrokes feeling. We are thinking of coming March 28. Will the gardens be filled and blooming with spring flowers? It looks like the gardens are already beautiful! Dear Betsy, thank you for your comment. The very first days of the season, just out of the winter, is a time I love. The plants are awakening, we can feel this amazing energy of nature. 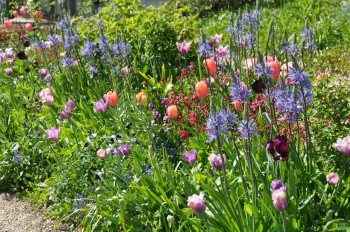 But if you want to experience the Monet garden full of blooms and colors, you will have to wait up to the end of April. Then blooming is continuous up to October. Enjoy your time in Giverny!